Description: After the Cylon attack on the Colonies, the battered remnants of the human race are on the run, constantly searching for the next signpost on the road to Earth. 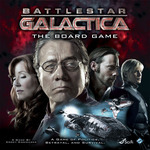 They face the threat of Cylon attack from without, and treachery and crisis from within. Humanity must work together if they are to have any hope of survival…but how can they, when any of them may, in fact, be a Cylon agent?